In finding sangria recipes for Bette Lee Crosby’s Words, Wit and Wisdom’s Midweek Mixers I came across this recipe on Pinterest. I had done white wine sangria for the other selections and wanted a red wine based sangria for the last one of the series. The fact that this sangria was partnered with tequila made it a must made. As usual, FRESH SQUEEZED juices are a must! This recipe was very different. In speaking with my husband (my official drink taste tester), both of us agreed that first drink, this drink had a very unusual taste. Then it took off and had a very nice balance to it. It wasn’t the overly sweet sangria that you get with white sangrias which ended up making it very mellow. The fruit soaked up the yummy sangria. #1) Place ingredients in the pitcher in the order given. Stir gently to dissolve the sugar. 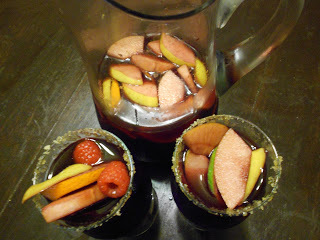 3) When ready to serve, rim sangria glass with lime juice and brown sugar. Fill glass with ice and pour sangria over ice. Be sure to top with some of that awesome fruit! Recipe adapted from Design Sponge.